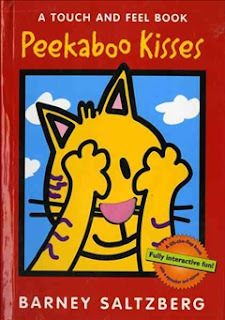 Peekaboo Kisses is a lift-the-flap board book by award-winning author/illustrator Barney Saltzberg. The premise is simple, as are the illustrations. Each page begins with 'Peekaboo! I see...', followed by an illustration of an animal hiding. Once you lift the flap of the animal who is hiding, you not only reveal what sort of animal it is, but there is a part of the animal to touch, such as fur on the puppy or wool on the sheep. This is the book that hooked my youngest son into reading, at about the age of ten months. I have noticed that he is a tactile learner and, as such, tends to prefer books which offer a tactile element. If your new little guy or gal is the same, then this might be the perfect book for your household. Peekboo Kisses is sweet, simple, attention-keeping, and great for the tactile littlees. Highly recommend!